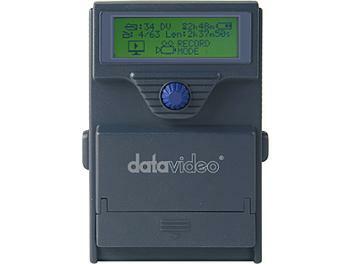 The Datavideo DN-70 is a portable, small size, and shockproof recorder utilizing the latest solid state technology of removable and high-capacity CF memory cards, providing hours of continuous high definition recordings, enabling you to take advantage of tapeless acquisition in even the toughest environments. Tapeless or file based video acquisition has widely become accepted as a replacement for outdated tape based systems. Recording times are far longer than for traditional tape, there are no dropouts and using Datavideo's Direct to Timeline technology, you will speed up the process from shooting to editing, thanks to fast file transfer, rather than traditional capturing from a tape. No dedicated player is required during the ingest as the CF Card can be inserted directly in the computer either directly or using a inexpensive USB adapter. The DN-70 connects directly to your existing camcorder via a traditional analogue audio and video cable, this makes it possible to take advantage of tapeless solid state recording even with analogue camcorders that often don't have a DV or HDV interface. In addition to video and audio connection the DN-70 also features connection to external time code and RS-232 control protocol, making it perfect in a multi camera production where it is important to keep the same time code on all units. The unit can also generate time code internally if no external time code is available or required. Time lapse recording down to a single frame recording for stop motion, science, model animation or many other application is standard in the DN-70. The lightweight (approx. 160g / 5.7oz) and flexable mounting options include tripod and hot shoe, make it easy to mount direct on your camera, and thanks to the solid state recording no noisy fan will interfere with the audio, even if the DN-70 is mounted next to the built in microphone. The DN-70 is powered using four traditional AA batteries, or widely available rechargeable AA batteries available. A set of batteries provides more than two hours continuous recording, depending on the type of battery used. Also included is an external power supply.